In a video interview, Paul Root Wolpe, director of the Emory Center for Ethics, explains how "there is no science fiction anymore" and the need for ethical guidelines for biotechnology. "Everything I read about in science fiction as a kid, we're either doing it or we're trying to do it," he says. Some of the world's preeminent scientists and bioethicists gathered with leaders of philosophy, sociology, law, policy and religion in Atlanta May 18-20 for BEINGS 2015. The landmark summit launched work on a global consensus for the direction of biotechnology for the 21st century. The setting for this futuristic event: The Tabernacle, an historic former church turned music venue, with red walls swirled with murals and wood floors that creak like the deck of a ship. Novelist Margaret Atwood, creator of fictional laboratory creatures such as the pigoon, gave a keynote. "The lid is off the Pandora's Box of genetic modification," Atwood said. "This is a pivotal moment. Deliberate well. Keep the bar high. Take precautions." And with that, the tumultuous voyage began. BEINGS, short for Biotech and the Ethical Imagination: A Global Summit, was organized by Paul Root Wolpe, director of the Emory Center for Ethics. "The idea is audacious," Wolpe admitted of their plan to write global guidelines for the aspirations, ethics and policies of biotechnology within the next eight months. 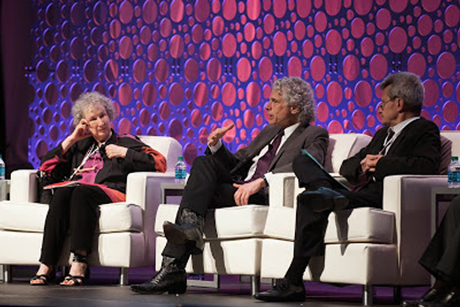 Novelist Margaret Atwood (left) appeared at BEINGS with cognitive scientist Steven Pinker (center) and Thierry Magnin, who is a physicist, Catholic priest and professor of ethics.